Even though Latin America represents only 3% of the entire programmatic market, it’s the one that has the highest growth rate – partially due to smaller Latin American markets, which have started to awaken for ad automation. One of these countries that saw an increase in the programmatic market is Ecuador, which has registered a growth of 71.5% this year, compared to last year’s performance; the highest rate in the region, according to the latest MagnaGlobal report. Ecuador is followed by Uruguay, with 68.5%, Argentina (62%), Colombia (61%), and Brazil (54%). The last three countries, according to their growth rate, is Mexico, Chile, and Peru, with 53%, 43.5%, and 42.%, respectively. In total, programmatic sales are expected to reach USD$33m (£25.4m) this year. 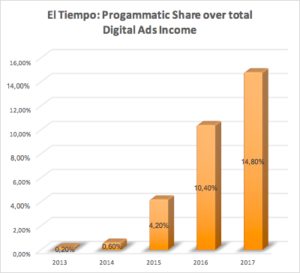 In the past two years, programmatic stake in the Colombian publisher El Tiempo’s revenues has jumped from 4.2% to 14.8% (see graph on the left). 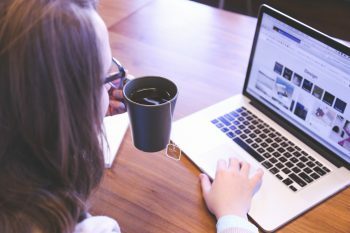 Currently, the importance of automated ad sales is so high that Daniel Rojas Rincon, digital director, El Tiempo Casa Editorial, is bold: “It does not make sense for us, economically speaking, to dedicate a salesperson in Los Angeles.” The publisher has gained new advertisers with programmatic, including some US-based brands. “We realised that a high number of high-quality advertisers around the world were buying ads using programmatic tech to reach their customers”, he said. The main ad tech in the company’s inventory is run with Affiperf, Havas, and Smart AdServer, which guided the company through their first experimentations. “We started fast and cheap, so that we could create lucrative spaces, using rich media for brands that would not be in our direct reach”, revealed Rincón. One of those brands is Netflix. From that, the strategy evolved. Now the strategy goes on steadily. 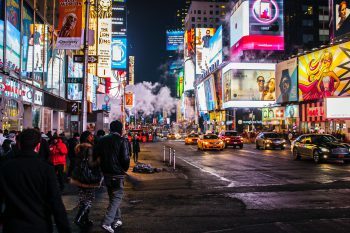 One of the main learnings was that the return of ads targeted to their hispanic audience in the United States could be higher than their readers in LATAM – which would be hard to discover without programmatic. The digital out-of-home company QDOT announced new hires, including the head of a new team of developers in Montevideo, Uruguay. Juan Pablo Russo will be responsible for driving the growth of QDOT’s operations locally with the support of the technical project manager, Natalia Morales. He is also in charge of London’s sibling team. Russo, who is also a part-time professor of software engineering at Universidad ORT, has previously held roles at Montevideo-based Globant, and technical positions for Integra Tv, Interactive Networks Inc, and Víctor Paullier & Cía. Learn how we helped the largest newspaper in Colombia boost revenue by displaying Netflix ads US-based to Spanish-speaking audiences.